A local Waterstones added a steampunk shelf a little while back. It started out as a few books on a special stand, and has slowly mushroomed into a much bigger stand and a table. 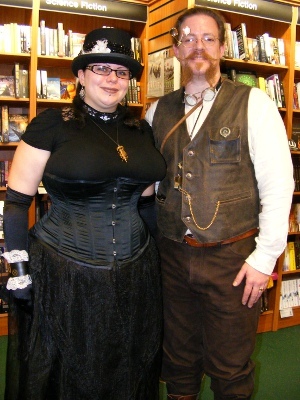 Last week when we brought a steampunk book*, one of the staff said they’d be launching the steampunk section this week. No one in the family had any goggles, but we head out anyway. 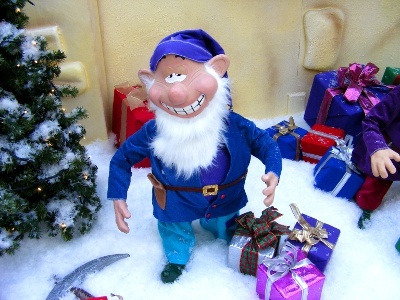 We had to edge past the evil elves** in Santa’s grotto, but made it to the bookstore unharmed. The event was attended by the Hastings Steampunk Society in steampunk costumes, and there were displays of steampunk gadgetry. The itinerary said they’d be tea duelling*** later, though I wasn’t around for that part. The only thing I do wish is the bookstore had spread it out a bit. They could have cleared one of the display tables for a few hours, to spread the steampunkiness around (which would have make it easier to browse the steampunk books). One of the Krampus’s minions. Note the pickaxe. Steampunk stuff with some of the books on display. 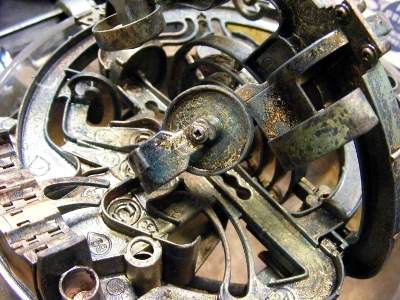 Mechanical closeup. I don’t know what it does either. Goggle fashions. I’m not quite sure how you see wearing those, but they’re nifty. Steampunks from the Hastings Steampunk Society. One thing I’ve been asked is what books they’re stocking. I took photos this time, and have created a masterlist! (I may have missed some, and some books that were there in the last few weeks had been sold, but it’s a snapshot in time. Or something like that.) Though it’s not a bad list for finding steampunky books, I’d note some series didn’t have all the books present (probably because they’d sold some). 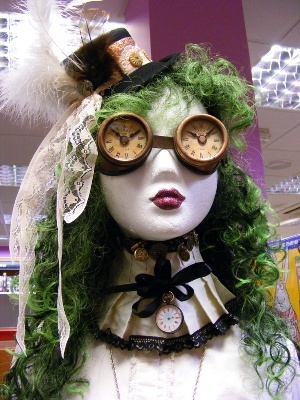 Some may be more Victorian fantasy than steampunk, but don’t shoot the messenger… they were on the shelf****. * I say ‘we’, but one of my other family members brought it. I plan to steal it. So it’s both our book in a way. *** I’ve never tea duelled, but my understanding is contestants dunk biscuits in tea and try to eat them without them falling apart. 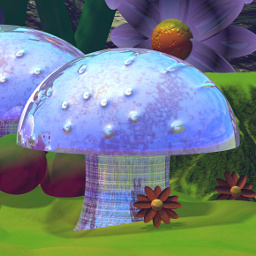 **** I also find it best to stay well back from genre classification arguments, as they can be scary, scary places. 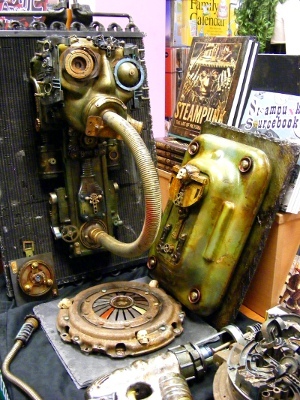 I know at least one of the books I’d call steampunk, the author created a brand new genre for their book. It didn’t catch on. The seasonal merriment has started. At least, it has in my house, where we have people of mixed religious persuasions. The solstice involved mead (traditional) and Chinese food (not so traditional). I didn’t post about it when it happened, because I was busy eating. And then sleeping off the eating. We also had a sparklie candle. It’s harder to see the sparkles when it’s lit, but the snowflakes are glittery. Happy holidays to everyone, whichever ones you celebrate. 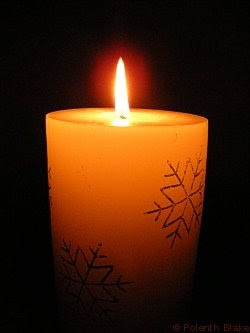 May the season be full of sparklie candles.